"A cup of tea would restore my normality." Afternoon tea has been as traditional as the rising sun and its known healing benefits date back very far. Archeologists have agreed that the ancient use of green tea for health dates back to man's very early discoveries. Tea contains useful compounds that are purported to increase health benefits, stimulate healthy cell regeneration and taste good over ice. The group of naturally occurring compounds called phenols and polyphenols containing catachins and bioflavinoids are responsible for the taste and palatability of the herby drink. But they also pack a huge dose of vitality acting as powerful antioxidants, astringents and anti-inflammatories that can "normalize" you inside and out. Dietary Benefits - when you consume teas you can experience the abundant benefits of vitamins, minerals and complex compounds to your blood stream that can improve circulation, aid in digestion, calm nerves and aid the reduction of stress and sleep complications. Topical Benefits - Those who use tea as a topical solution can experience more vibrant, clearer skin, firming of saggy skin, more supple and smooth skin texture, calm down over-active sebaceous glands and reduce the signs of oxidative and premature aging. HOW DO I ENJOY TEA ON THE OUTSIDE OF MY BODY RATHER THAN THE INSIDE? 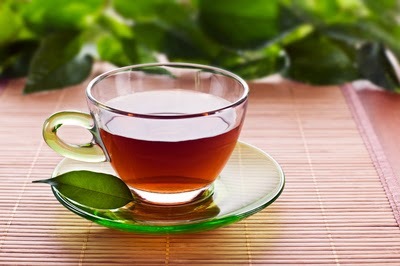 - Using hot water, steep a cup of tea for 3-4 minutes. Use 1 part cooled tea to 4 parts cool temperature water in a bowl or jug. Use a sterile cheese cloth or clean face cloth soaked in your cooled down tea solution and place over face or affected area for approx. 3-4 minutes at a time for up to 20 minutes (or you decide). You can also choose to use a cotton ball to swipe tea solution over your freshly washed face and allowing skin to air dry. You can do this weekly to calm down stressed skin and firm up saggy jowls. TASK DURATION: approx. 25-30 minutes. Green Tea - has vitamin C, D, B1, B2 which is good for skin clarity, is highly antioxidative which helps revitalize dull skin and slow signs of premature aging. Rosehip Tea - has vitamin C and rich in 32 other minerals such as beta carotine, bioflavinoids that can improve elasticity and increase firmness of skin. Peppermint Tea - is a natural antiseptic that has a cooling effect to skin, it improves circulation, stimulates nerve ending for aging or damaged skin, revitalized dull complexions and is antibacterial. Ginseng Tea - is known for it's anti stress and aphrodisiac properties, it is detoxifying and strengthening for skin, healing for irritated skin, refreshes dull complexions and cell activating for aging skin. Other great teas for the skin are chamomile, lemon or try your own blend to suit your tastes. Remember that tea may have powerful naturopathic effects and no regulated pharmaceutical governance considers tea an effective drug or treatment, therefore chemical compound constituents of tea nor any health claim from such constituents is not approved nor regulated by the FDA. Use tea at your own risk. EXTRA... DID YOU KNOW? Tea contains approximately an average of 10% caffeine. Caffeine can be very effective in treating the skin. When caffeine is absorbed by the body it creates a molecular chain reaction of vitalizing lipid cells and fatty acids that stimulate and increase nutrient flow during intracellular metabolism. Caffeine fights free radicals, soothes inflammation, treats dark circles and cellulite. NOTE: The preceding text is not a replacement for doctor's advice, if you have a serious condition, seek the advice of a doctor.